Gates Repair & Machine Offers Auto Repair Services You Can Count On! 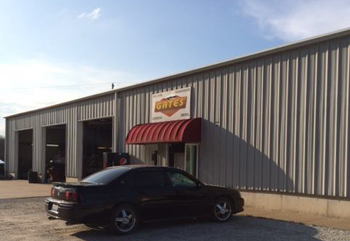 Since 1988, Gates Repair & Machine has provided motorists in the Barry, IL 62312 area with comprehensive auto repair services that include 4x4 Services, Brakes, Car & Truck Care, Domestic Cars & Trucks, Electrical Services, Electronic Services, Engine & Transmission, Engine Maintenance, General Services, Heating and Cooling Services, Import Cars & Trucks, Inspections and Emissions, Miscellaneous Services, Tires, Towing, Transmission Services and Undercar Services. Our goal is to offer the best services available at affordable prices to get you back on the road in no time. For a high-performing vehicle, trust Gates Repair & Machine with your car, truck, or van. To learn more about the services we offer, please contact us by phone at 217-335-2378 or send us an email. We also invite you to learn more about our dedication to you, our valued customer. My husband and I were in Barry for the fall color drive when our wheel baring on our truck broke. Being an hour and a half from home we had no idea what to do so we stopped at the local Ford dealer who called Rob to see if he could help. Rob was closed as it was a Saturday but by the grace of God he and his wife were at their shop having a garage sale. He certainly could have said no but instead opened his shop and repaired our truck for us. Wonderful wonderful people!! We were very pleased with the efficiency of the service to our vehicle. Great place! Pulled in off the highway on a long road trip.Fixed the problem while we waited in less than an hour and we were back on the road. Folks there couldn't have been nicer. ...I am SOO happy I started coming to you. There is so much more preventive maintenance done that keeps my old truck in tip top shape and minimizes the "surprise" break downs. You always stay in touch with me on repairs and cost as you go and that is very much appreciated. Rob and Melinda are second to none! Proof that small town hospitality is still alive and well! Melinda personally took my mother and I to a place to eat lunch while we waited and when things got complicated, they let us use their company pick-up to drive back to Pittsfield, IL to stay at my son's for free. Couldn't have asked for better treatment under the circumstances! Thank you BOTH so much! As a traveler from out of town I was extrememly impressed with the friendly professional atmosphere and the "you cared to get me on the road" attitude. I am very thankful for your service. Rob & Associates, Just wanted to thank you again for getting my truck fixed so quickly and getting me back on the road. I sure appreciated your kindness. The truck ran like a new one the rest of the trip. Thanks again!